Ch. Pickwick's Spoonful of Sugar, "Brella"
UKC Ch. Pickwick's Bibbidi Bobbidi Boo, "Pumpkin"
Pickwick's A Little Less Conversation, "Gabby"
Ch. Pickwick Ariella's All About Me, "Duffy"
Can. Ch. Pickwick's Grant Me One Wish Aveiro, "Jasmin"
Ch. Pickwick's Salty Girl Del Pacifica, "Holly"
Pickwick's Blitzen Del Pacifica, "Blitzen"
Ch. 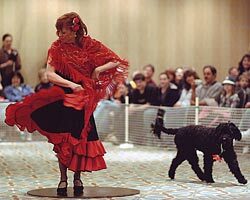 Pickwick's Dancar del Pacifica, "Dancer"
Ch. Del Pacifica's Mm Mm Good, "Campbell"
Ch. Sagres Primo Del Pacifica, "Primo"
Ch. Pickwick Oliver! Del Pacifica, "Oliver!" Ch. Pickwick's Sea Ketch of Noble, "Bear"
Ch. Pickwick's Navio Progresso, "Tory"
Ch. Pickwick Portago Fish N' Ships, "Cody"
Ch. Pickwick's Shipboard Romance, "Mandy"
Ch. Pickwick's Navio do Portago, "Shipley"
Ch. Pickwick's Cool Rue O'Windruff, "Rue"
Ch. Pickwick's Windruff of Rygate, "Kali"
Ch. Camerell's Mister Pickwick, "Dewey"
Ch. Querida's The Green Monster , "Fenway"
Ch. Do Gato's A Cura Com Amor, "Jonah"
Ch. Sweetmeadow's Forever in Blue Jeans, "Levi"
Ch. Jewel de Agua Paolo, "Paolo"
Ch. Ariella's Meu Camarada Pequeno, "Tex"
Can Ch. Acostar Angelo's Good As Gold, "Phoenix"
Abadessan's Marked Man at CnSand, "Gotti"
Ch. Driftwood's Bacchus Dos, "Deuce"
Ch. Driftwood's Sinbad Latte, "Sinbad"
Ch. Calypso's Instant Karma, "Karma"
Ch. Sapphires Effervescence of Seastar, "Bubbles"
The Portuguese Water Dog is a medium sized, lively robust dog. See the AKC Breed Standard for more details. Known for centuries as a lifesaver, courier, retriever and companion, the Portuguese Water Dog has long been associated with the life of the Portuguese fisherman and with the sea. He is a recent arrival on the pure-bred scene in the United States, only gaining AKC recognition in 1984. This versatile breed is winning the hearts of sailors and land lubbers alike. Read about the PWD History. 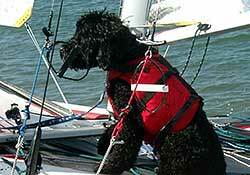 The Portuguese Water Dog makes a great companion for active people and families. They enjoy performance events such as agility and water work. They are equally content being treasured family dogs. However, they are working dogs! They often "help" with the laundry (stealing socks), making the bed (snoozing on it & pillow stealing) and they will even help with dinner (counter surfing)! One of the greatest things we've enjoyed about our dogs is how "reflective" they are of us and our life style. 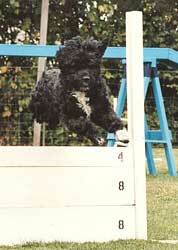 The Portuguese Water Dog is wonderfully adaptive to their surroundings and families. They are just as happy to take a snooze on a Sunday afternoon or equally up for a swim in the pool or adventure. Each one of our dogs has fit the definition of a PWD but some have had emphasis on certain traits. Duffy needs a significant amount of daily exercise to be provided for her or she will find it herself! She also is a thinking dog and likes games, challenges and her energy channeled. Dominique likes to be center stage, but makes it quite clear who her "people" are. One thing is certain - they love their families! They are a great family dog and thrive with being with their "people". 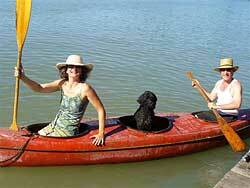 When making the decision to own a Portuguese Water Dog, please do your homework. This non-shedding breed isn't for everyone! Early obedience training is mandatory, a commitment to exercising and grooming the dog and a sense of humor is required by those wanting to own the PWD!